Luninets (Belarusian: Лунінец, Russian: Лунине́ц, Polish: Łuniniec, Lithuanian: Luninecas, Yiddish: לונינייץ‎, translit. 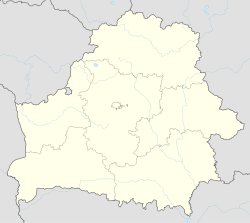 Luninitz BGN/PCGN romanization: Luninyets) is a town and administrative centre for the Luninets district in Brest Province, Belarus, before which it was in Poland (1540–1793, 1920–1939) and Russia and the Soviet Union (1793–1920, 1939–1941, 1944–1991). It has a population of some 24,000, and is immediately east of the Pinsk district within Brest. It was home to Luninets air base during the Cold War. Luninets is said to be mentioned in print sources dating to 1540. It was part of the Pinsk region which was under Polish rule between the 16th and 18th centuries but fell to Russia in 1793 in the Second Partition of Poland. In 1888, while under Russian sovereignty, a railway junction was built in Luninets, linking it by rail to Warsaw, Rivne, Vilna and Homel, and a proper railroad station was added in 1905. Luninets became part of Poland in 1920 following the Polish-Soviet War, but nineteen years later was incorporated back into the Soviet Union in 1939, and, with the exception of occupation by Nazi Germany from 10 July 1941 to 10 July 1944, remained part of the Soviet Union until 1991, at which time sovereignty ceded to the Republic of Belarus. The Jewish population was important in the town. From 1941 to 1943, 4 000 Jews were murdered in mass executions perpetrated by an Einsatzgruppe. ^ D.E. Rosental, Slovar' udarenii dlya rabotnikov radio i televideniya (Moscow, 1984), p. 640. Wikimedia Commons has media related to Luniniec. This page was last edited on 5 February 2018, at 22:42 (UTC).